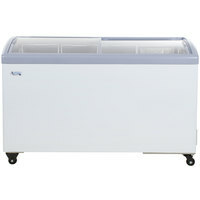 Add ice cream treats and other frozen novelties to your business with this Avantco ICFC6-HC 5.3 cu. ft. curved lid display freezer. 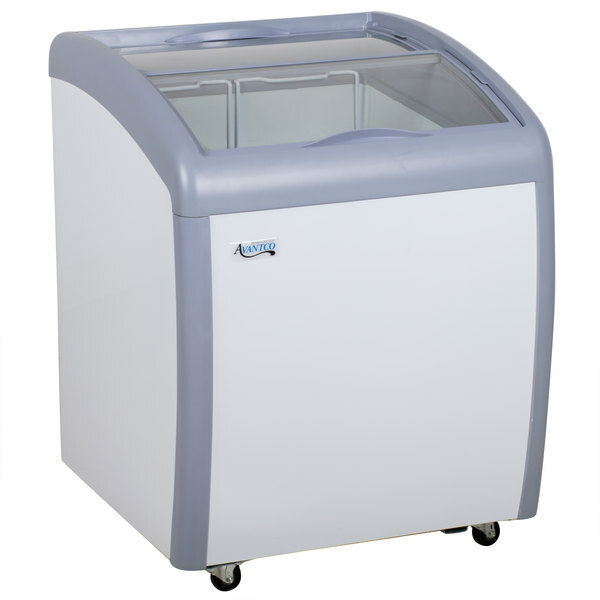 This freezer provides crystal clear visibility of your hottest selling cold treats, while also maintaining consistent internal temperatures. Great for markets, diners, convenience stores, and ice cream shops, this display freezer keeps frozen foods within easy reach and helps to increase impulse sales. "Perfect small display freezer. It freezes quickly and well. It has baskets that are great for storing and stacking items. I would purchase again if I needed another." 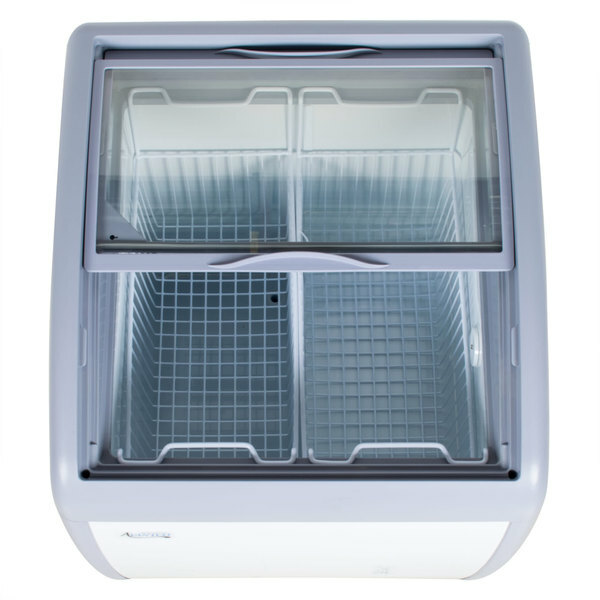 This freezer comes with two baskets to help you organize the interior and better promote your frozen foods. Great for smaller items like ice cream sandwiches, the baskets also help to keep small items within easy reach for your customers. 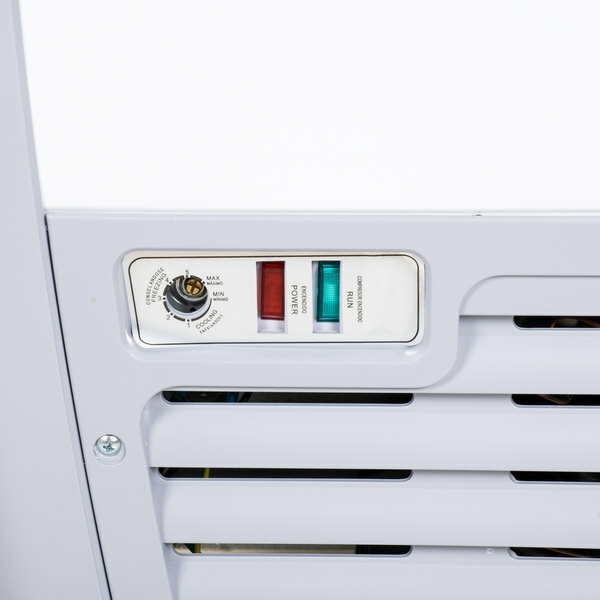 The interior is made from durable painted steel that's extremely simple to clean. A white powder coated steel exterior with a gray frame provides a sleek, attractive appearance. Foamed in place polyurethane insulation helps maintain temperatures and boosts structural integrity. Designed with tempered glass that is more durable than traditional glass, this unit's curved lids slide for easy access to your ice cream novelties. The clear glass promotes excellent visibility to help boost impulse sales. This freezer has a temperature range of -13 to 0 degrees Fahrenheit. 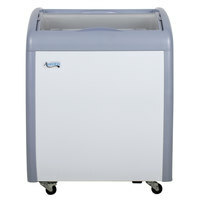 Casters allow you to easily move the freezer for simple cleaning under and around the unit. 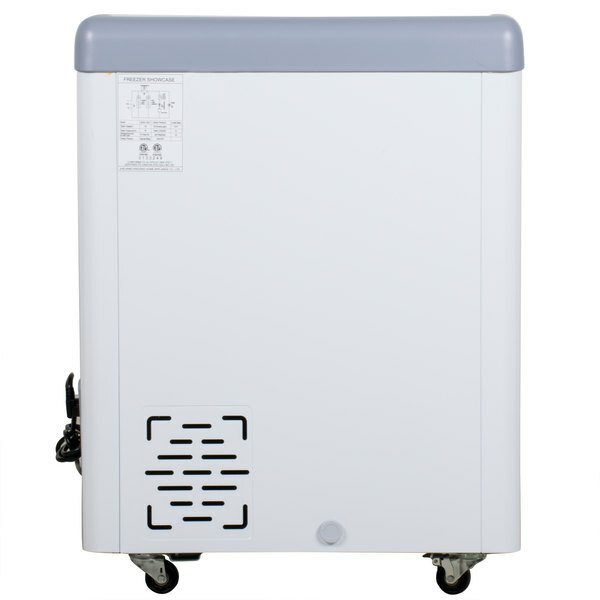 The freezer's 1/6 hp compressor uses R290 refrigerant to deliver consistent temperatures between -13 to 0 degrees Fahrenheit. This specialized refrigerant has an ozone depletion potential (ODP) of 0 and a global warming potential (GWP) of 3, making it an environmentally-responsible choice for your business. 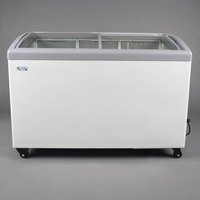 Display frozen treats and other novelties items at your business with an Avantco curved top display freezer! 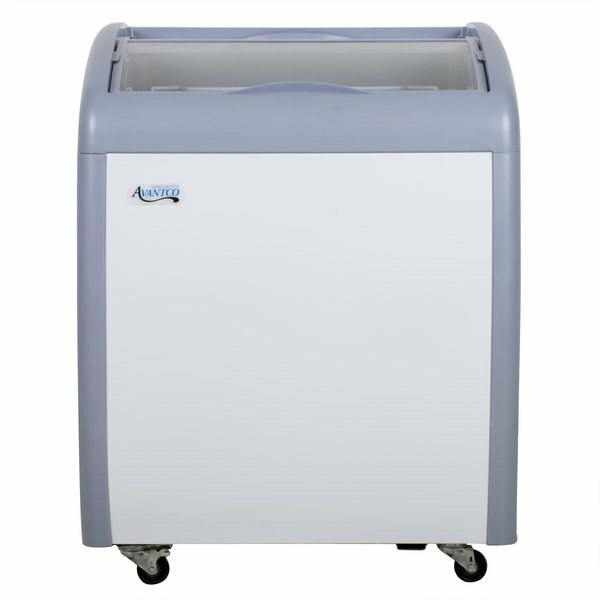 Perfect for serving popsicles, pints of sorbet, and frozen appetizers, these display freezers keep your products cold while merchandising them for quick sale! 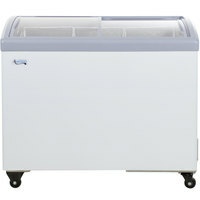 Featuring an attractive, white powder coated exterior, these glass top freezers are great for self-serve applications. For optimal organization, each freezer comes with interior baskets that are great for separating different products. 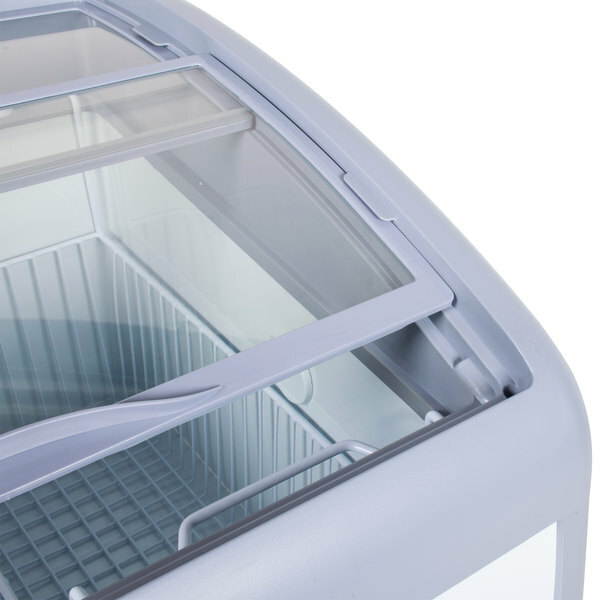 To help accommodate a variety of products, these freezers can be adjusted from -13 to 0 degrees Fahrenheit. The foamed in place polyurethane insulation helps maintain cold temperatures and boosts structural integrity for long lasting performance. 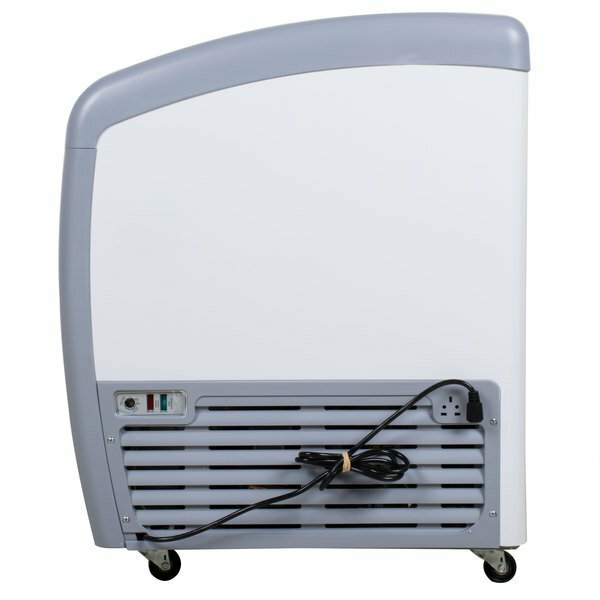 Boasting environmentally friendly R290 refrigerant, these units are a responsible choice for your establishment, as well. 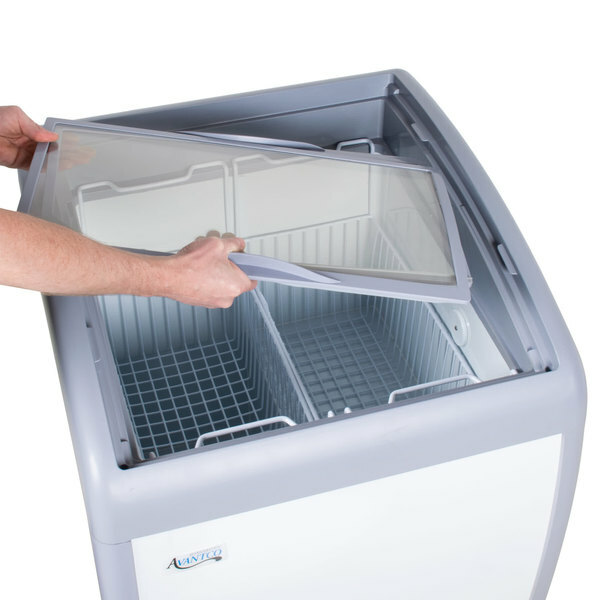 For convenient cleanup, each Avantco curved top display freezer comes with a drain plug. 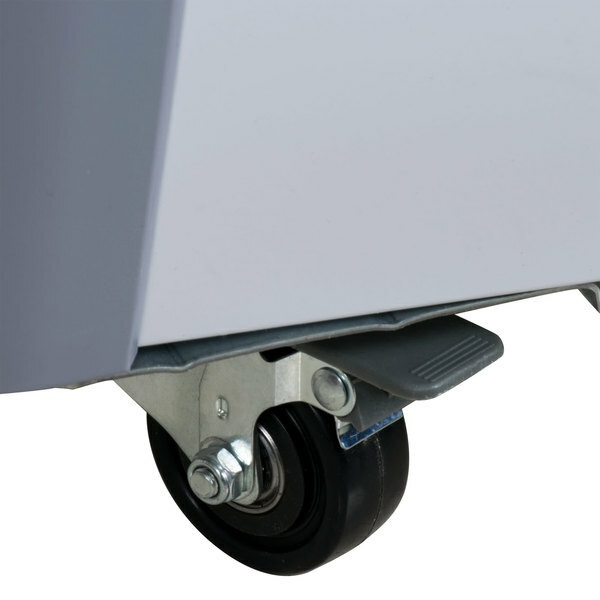 A set of casters is also included, allowing you to easily move the freezers for simple cleaning under and around the units. These units come in four convenient sizes ranging from 26 to 54 inches, so you can find the perfect size for your location. 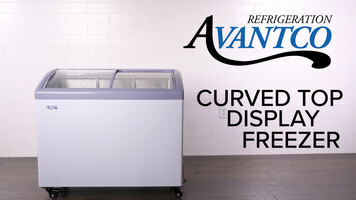 Great for markets, convenience stores, schools, and more, our Avantco curved top display freezers are sure to be a hit in any setting! Perfect small display freezer. It freezes quickly and well. It has baskets that are great for storing and stacking items. I would purchase again if I needed another.